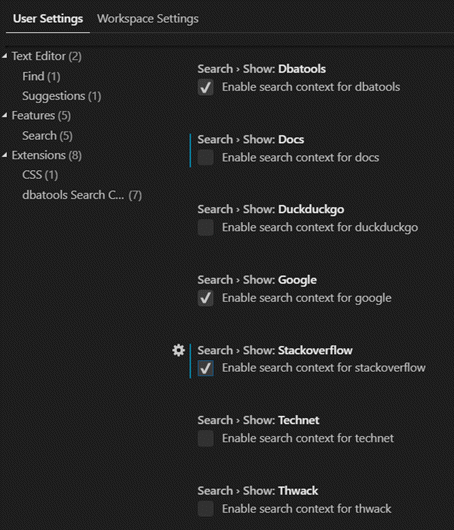 We recently released a VS Code extension that lets you highlight terms and search dbatools.io, Microsoft Docs, Google, StackOverflow, DuckDuckGo, Technet or Thwack right from your code! It’s called search from code and you can find it in the Extension Marketplace. By default, only Google, docs and dbatools are enabled but you can configure whichever providers you’d like in VS Code Settings. At first, I was just messing around to see what it took to create a VS Code extension, but then I realized that I was actually using it and decided to share. If you use VS Code, give it a shot and let me know if you’d like any features or additional search providers! P.S. Can’t see the gif? Watch the video on YouTube.